Born in Stoke-on-Trent but raised in Market Drayton, Chadwick began his career with Everton, a product of their academy system. He made his senior debut in the League Cup in September 2001 at the age of 18 and his Premiership debut came three months later. 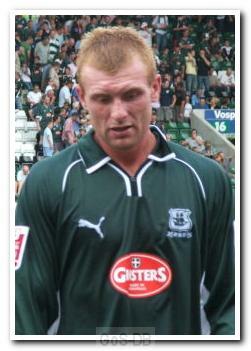 He was a prolific goalscorer for Everton's reserve side but could not force his way into the first team on a regular basis and, after loan spells with Derby County and twice at Millwall, he was glad to join Argyle when Bobby Williamson beat off competition from several other clubs to sign him for £250,000 in February 2005. The striker had clearly caught the eye of the Scottish manager with a goal for the Toffees in a televised FA Cup third round tie at Home Park the month before. 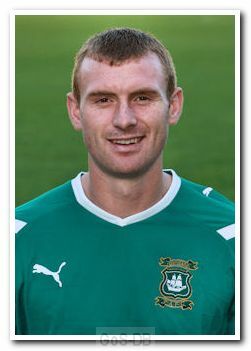 A combination of injuries and lack of goals meant Chadwick was never able to hold down a regular place in the Argyle starting XI and he was released at the end of his three-year contract. Following unsuccessful trials with Walsall and Cheltenham Town he joined Hereford United on a six-month deal, after which he had brief spells with Shrewsbury Town and Chester City. Financial problems led to Chadwick leaving Chester (with his goals and their results being expunged) for Barrow in January 2010 and he scored eleven goals in 35 games for the club over the next eighteen months. He then joined Stockport County before the 2011-12 campaign and scored seven times in 19 appearances, before agreeing a loan move to return to Home Park. 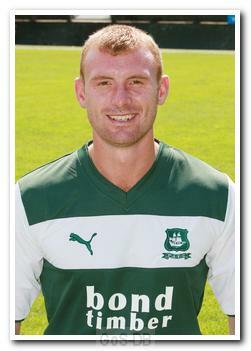 Following an impressive start to his second spell at Argyle, the move was made permanent when the transfer window re-opened in January 2012 and Chadwick scored some important goals as Argyle successfully battled to avoid relegation. A major blight on his Argyle career occurred in January 2013 after two incidents of violent conduct at Port Vale, the second of which resulted in a red card - all in front of Argyle's new manager-in-waiting, John Sheridan, who was watching on from the stand. 'Chadders' was subsequently given a hefty six-match suspension by the FA. Despite the extended spell on the sidelines, his contract was automatically extended for another year at the end of the campaign, due to a clause in the original deal. However, he was unwanted by John Sheridan and transfer-listed in the summer, in the vain hope of attracting interested parties. Chadwick required knee surgery in July 2013 that kept him sidelined for two months, but was loaned to Conference Premier side Tamworth, where he hit four goals in ten appearances. His Argyle contract was cancelled by mutual consent at the end of 2013, which allowed him to join the Lambs on a free transfer in January 2014, but he called time on his playing career at the end of that season. Chadwick then had a youth coaching role at under-15 level with Blackburn Rovers before moving in July 2016 to become the under-18s manager at Wigan Athletic. Chadwick had a successful loan spell at Tamworth, where he scored 6 goals in 12 appearances, helping the Lambs progress through to the 2nd round of the FA Cup. He returned to Argyle from his loan, but took no time at all in agreeing that his contract should be cancelled by mutual consent. Chadwick rejoined Dale Belford's side as they scrapped away near the bottom of the Conference Premier League, but he only scored 1 goal in his remaining 11 appearances, as he struggled with injuries, and Tamworth were relegated. Nick was released by Tamworth at the end of the season, scoring 7 in 23 appearances for the Lambs in total; however this strike rate was not enough to earn himself a playing contract at a professional level. Nick hasn't declared his retirement from playing, despite now working with the U-15s at Blackburn Rovers.